Through co-location (CoLo), participants are able to reduce latency and network complexity by utilizing high density cabinets and a single hand-off for all Nasdaq markets. Nasdaq offers a wide variety of connectivity options and market data to fit a firm's specific network and trading strategy needs. Metro Millimeter Wave: Receive the most popular equities and fixed income market data at latencies 40-50% faster than the fastest fiber optic networks. 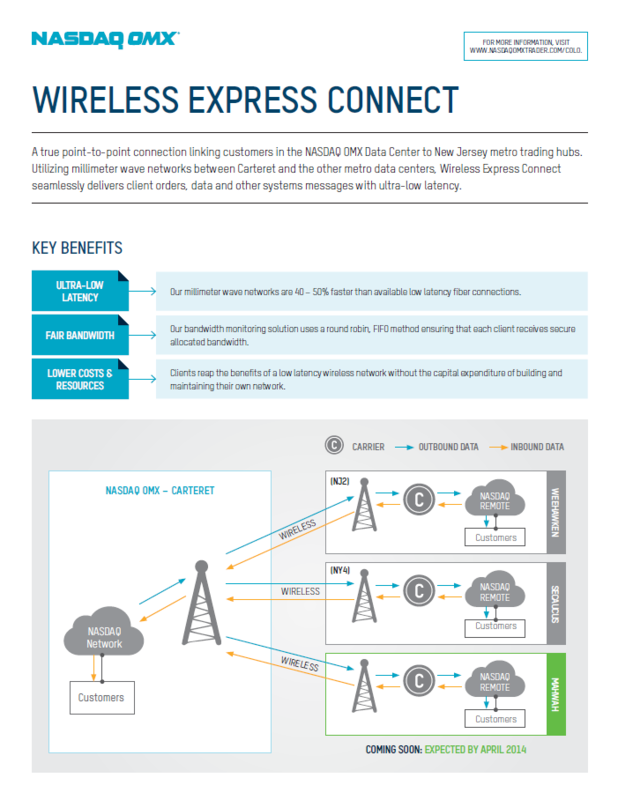 Wireless Express Connect: A true point-to-point connection linking customers in the Nasdaq Data Center to New Jersey and Chicago trading hubs to transport messages and data at ultra-low latencies. Connect to all Nasdaq markets and receive all Nasdaq and outside exchange data feeds. Reduce round-trip latency by an average of two to five microseconds. Need the speed but not the bandwidth? Our new 10G ULTRA option provides the same latency. Highly secure data center that provides redundant power with generator backup, efficient cooling and fire detection/suppression. 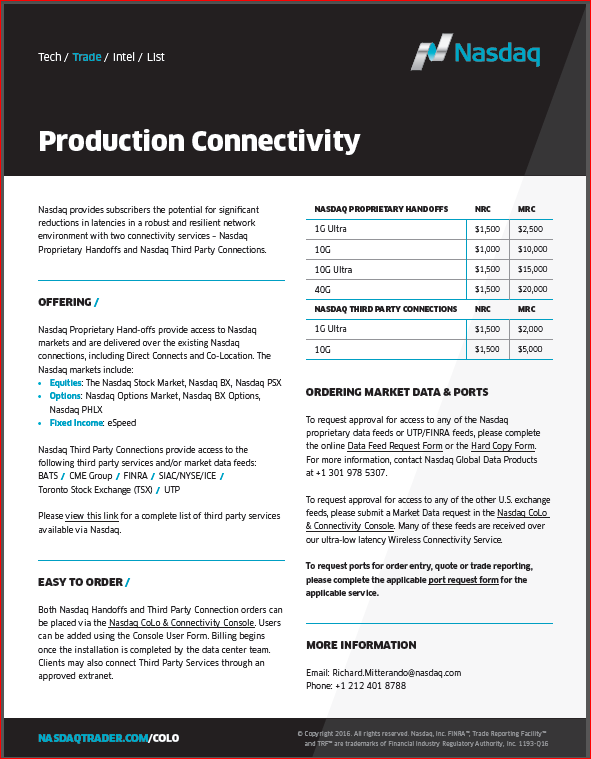 Many Telecommunications carriers are available, providing subscribers with an opportunity to establish diverse connectivity to and from the facility at competitive prices. High-Speed 10G Ethernet Network, round trip order-to-ack and market data order-to-tick latency is sub-50 microseconds. Subscribers can establish connections with more than 100 leading financial firms located in our facility. We offer a range of cabinets from low density starting at 2.88 KW to Super Cab, capable of handling up to 17.3 KW. 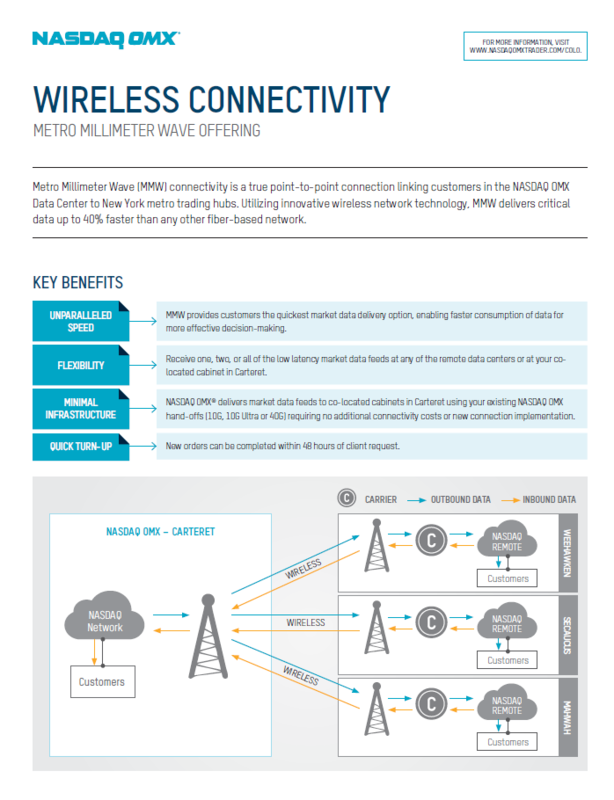 Customers can also choose from several connectivity options, including the high-speed 40G Network, and multiple Telco providers.